There are several species of Sundews, varying primarily in the shape and size of their leaves. Insects are attracted to a nectar like aroma which is secreted from the glands which are part of the many small traps which cover the plant. The sticky, dew-like nectar droplet has the same effect as flypaper when an insect comes in contact with it. The insect becomes mired down in the sticky secretion and the tentacle like mechanism of the plant slowly folds over the prey, pushing it in toward the digestive enzyme glands in the center of the leaf. Sundews are probably the best plant for a gardener who has just begun to grow insectivores, because of their durability and ease of care. Sundews should be grown in direct or slightly filtered sunlight. Sundews should be grown in a mixture of Sphagnum moss mixed with peat moss and a little perlite (or coarse builders sand) to keep the mixture from compacting. The growing medium should be kept very moist at all times during the growing season. Only rain water or distilled water should be used to water insectivores! 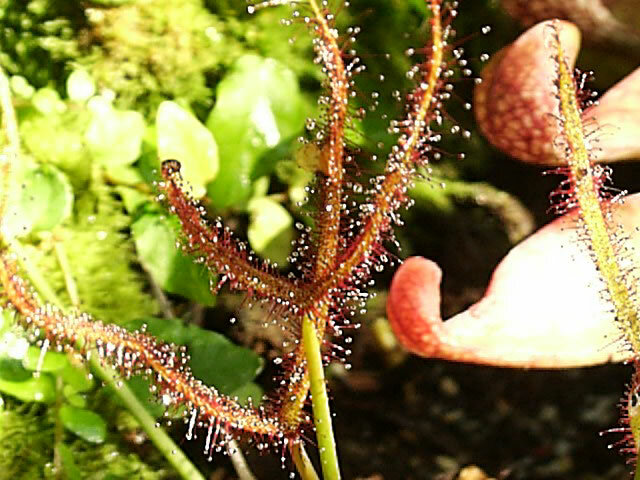 Sundews grow best with a summer temperature range of 70-100 degrees and winter temperatures between 38-45 degrees (their dormant period). 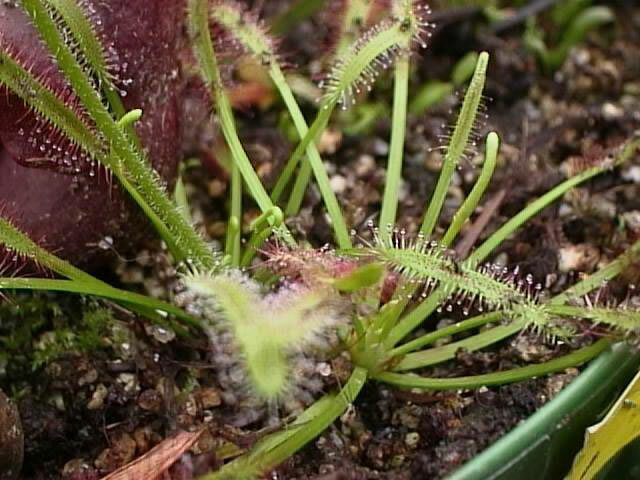 Some Sundews require a Winter dormant period which varies with the species. They will die back, forming a rosette of small non-sticky leaves. During this time, keep your Drosera a little drier (but still damp) and in a cool location.